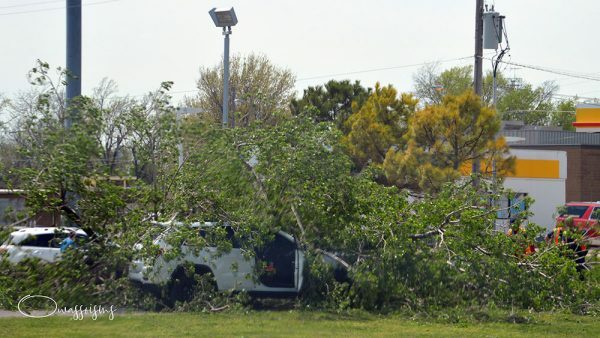 04/10/2019 – Just after 1:30 pm Wednesday, strong winds toppled a large tree near McDonald’s on 76th Street North crashing into a car on the service road below. Though the car has extensive damage, the female driver appeared unhurt. She said she saw the tree falling and all she could do was duck and cover her head. Owasso Fire brought out chain saws and were cutting up the tree, which is on city right-of-way, to uncover the car and reopen the roadway.